A man who was allegedly wearing body armor and carrying an arsenal of dangerous items in his luggage when he arrived in Los Angeles on a flight from Japan pleaded not guilty Thursday to a federal charge of lying to customs officials. Yongda Huang Harris, 28, of Boston is charged in Los Angeles with one count of making false statements on a customs declaration form, which carries a penalty of up to five years in federal prison. The charge supersedes an earlier federal count of transporting hazardous materials. According to an indictment unsealed Thursday, Harris falsely identified China as the only country he had visited prior to his arrival in the U.S. and falsely stated that he had only $100 in items purchased abroad. Harris was arrested Oct. 5 after landing at Los Angeles International Airport wearing a bullet-resistant vest, flame-retardant legging covers and knee pads beneath a trench coat, federal authorities said. The discovery of a smoke grenade in his luggage triggered the initial charge because such items are prohibited on passenger aircraft. The device is under investigation, officials said. The defendant did not speak at the hearing other than to respond to the judge’s questions. “Not guilty,” Harris replied when U.S. Magistrate Judge Fernando M. Olguin asked for his plea. Harris is due back in court in downtown Los Angeles Dec. 17 for a status conference, with a trial date set for Jan. 8. Last month, Harris was ordered detained without bail pending trial after a judge found him a “flight risk,” citing his history of foreign travel and foreign employment and no significant ties to the Los Angeles area. 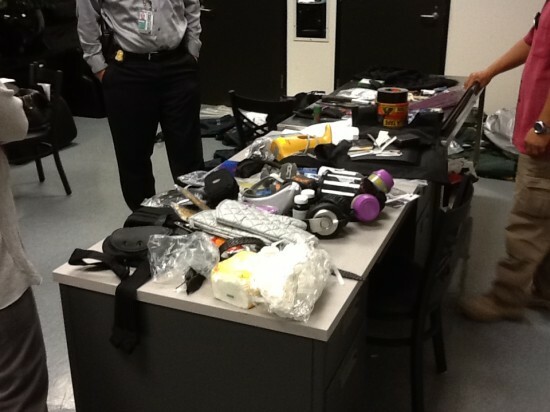 U.S. Customs and Border Protection officials said Harris’ luggage contained the smoke grenade, a hatchet, knives, a gas mask, biohazard suits, handcuffs, leg irons, a device to repel dogs, three leather-coated billy clubs, a collapsible baton and a full-face respirator.